A big hello to everyone all over New Zealand, I trust winter has been kind to you. I can sense it is beginning to weaken and the warmer weather this week should hopefully be testament to the coming of spring. But do not reduce your vigilance in regard to the weather, an important aspect of climate change is that patterns also will change and one can no longer rely upon prior trends. And just about this time every year we alert you that the Christchurch Show is about to request your attention. Yes it is happening this year November 15th – 17th, the format we will follow will be the same as last year – Wednesday will be the Public day, Thursday we will have the fleece and conformation classes and on the Friday we will have the performance classes. I will be the Convenor once again for this year, due to no one else stepping forward, and i will do my best to administer a good show. But you all know i am not very good at detail so don’t be afraid to jump in to keep things marching along. At this point I am looking for a volunteer to set up the PR course on the Friday, if anyone should wish to come forward that would be very kind. Next year, 2018, the Christchurch Show will be a “ROYAL” Show, and that always attracts a lot of contestants, so this year will an important opportunity to help you decide who will compete next year. Once again the A & P has agreed that you only need to be in attendance with your llamas for the days they are competing although they would be appreciative if we can have animals on display the Wednesday. Sara has very graciously agreed to manage the Wednesday activities for us once again. And once again the A & P has determined that TB testing will be in line with the ‘voluntary’ requirement, so it is again not compulsory. As a matter of course and sound animal husbandry I would recommend that every llama owner have their animals tested on a regular basis, but it is not a prerequisite for this show. If anyone has any thoughts, ideas or inspiration about altering the show structure or format, for goodness sake, please let me know! 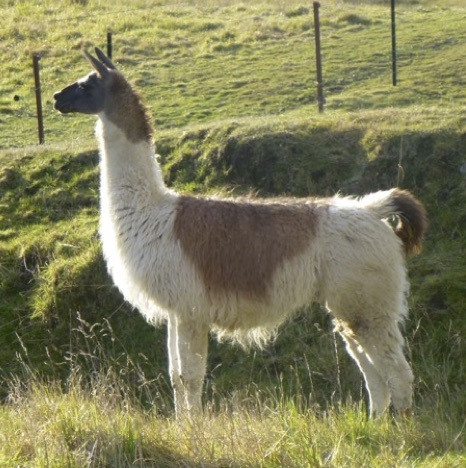 I am still looking to the members for some inspiring llama photos to grace the pages of our facebook entry and our web site. Can anyone tell me what type of llama pictured here? Is it a ccara, a chaq’u (woolly) or a suri?